You probably have lots of locks for different uses in your life including the locks for your home, office, and business. If you are like most people, you will probably lose a key at one point or another. If you do, you will need to contact a locksmith. We will help you get into your home or office. We can work with all types and sizes of locks. Their job may include installation, repairs, and fixing your locks. We may also provide you with advice if you are unsure of the right lock for your needs. If you want to get into the job, you must be able to work with a variety of locks. It takes lots of practice and training. The following are some of the things you need to become a locksmith. Training for this job requires you to get both practical and theoretical skills. 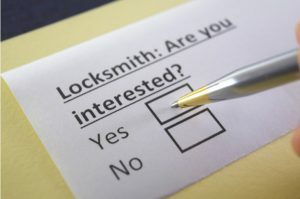 You need to attend a locksmithing school or a training program to acquire the relevant skills. You may choose to study online or in-person. The key is to find a program that is credible. Some of the things you will study include; lock installation and picking, different types of locks including commercial and residential locks, high-security locks, and more. You will receive the relevant knowledge in theory. After the theoretical training, it is time to get some experience in practice. You may need to complete an apprenticeship or to work under the guidance of an established professional. You will get a chance to experience the daily life of a working locksmith. Even though you do not need certification to get into the job, it may help your potential customers to trust you. They give you access to sensitive parts of their homes so it is only right that you put in some effort to earn their trust. Certification makes you appear as credible and reliable. You should submit to a criminal history background check to prove that you are honest. You may work in plenty of areas including the public sector and corporate businesses. There is always a need for new locks or lock repairs. Most of your job will be outdoors. You have the option of setting up your own shop or working for someone else. You must be ready to work odd hours as some clients may need emergency services. At CPPM, we provide you with professional locksmith services in Abingdon, Oxford, and the surrounding areas. Our technicians can work with locks for any type of door, garage, window, or cabinet. All our locks conform to British standards. We understand that criminals may hire us to break into your home so we have to check your ID before offering our services. We know that security is our priority so we make it ours too.